Mike, I received your message here. Go from Henderson South toward Phoenix on the 515, 93,95. Through Boulder City to the Hacienda Hotel & Casino. Go @ 1/2 mile to the Hoover Dam exit. Exit #2 at the stop sign turn right, go @1/4 of a mile and the road turns to dirt and splits. Turn left and go @ 1/4 of a mile where the road dead ends into a parking lot. 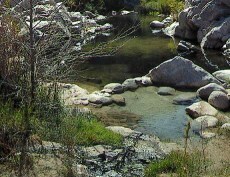 It is a 2 mile hike to the first signs of water springs. Then another 1/2 mile to the Colorado River. Remember to carry lots of water and gloves if your hands are weak. There are 3 or 4 places where you must repel on ropes. Good luck and please carry out yours and others trash if possible. Also, you may want to print out these directions and take them with you for accuracy.